Then came the art. There was ceramic art, rusted steel sculpture, blown glass, oversize pottery, wind sculpture, even a set of antique Chinese doors. What was I to do? An honest garden designer will frequently tell you that it is easier to design a garden for someone else than for yourself. Good judgment with regard to design principles is easily clouded by emotional attachment to heirloom plants or collected art. If you are an out-of-control collector, a good garden designer could be your best friend.If the thought of hiring a garden designer to brutally tame your collection scares you, and buying the vacant lot next door for expansion isn’t a possibility, there are some design principles you can employ to test the waters. Depending on what you collect, some of these principles will apply more specifically to your garden than others. 73. A set of Chinese doors marks the entrance to a hosta garden at the top of a koi pond. 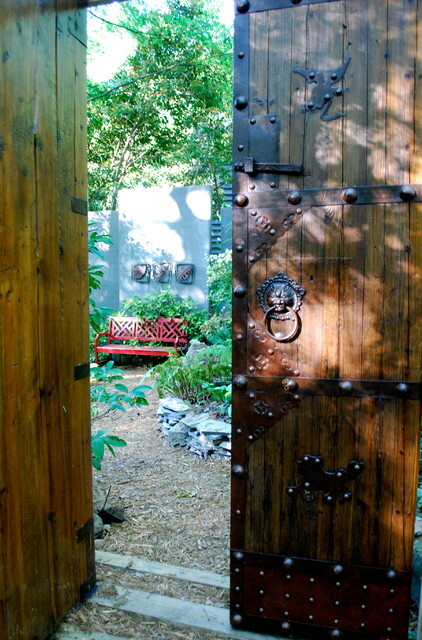 Landscape designer and Houzz contributor Jay Sifford says they create a sense of journey and mystery, pulling visitors into the next area of the garden. The sense of anticipation is thrilling.